Bellew loves winding up opponents but will it work against Usyk? Engaging opponents in mental warfare has been a successful tactic for Bellew, who challenges Usyk for all the world cruiserweight titles at Manchester Arena on Saturday night, live on Sky Sports Box Office. No, I don't believe Bellew can do anything prior to the fight that's going to unsettle Usyk, who has seen it all. He's come from a tough upbringing. First of all, he doesn't speak English, so that doesn't help. But I think during the fight Bellew can rough him up. He can get inside, use his head, elbows, low blows. I definitely feel he needs to rough Usyk up. Having a long-range boxing match against someone who is so technically gifted could be the wrong strategy. Bellew's usual rants will be lost in translation. Whatever Tony says to try and wind him up, all Usyk will recognise and understand are his mannerisms and posture. Looking right, rather than speaking or shouting out the right things, will be the best way to get to him. We saw in their Wembley face-off, Bellew stood his ground, didn't budge, as if to say 'you are in against a man, and a proper fighter now'. 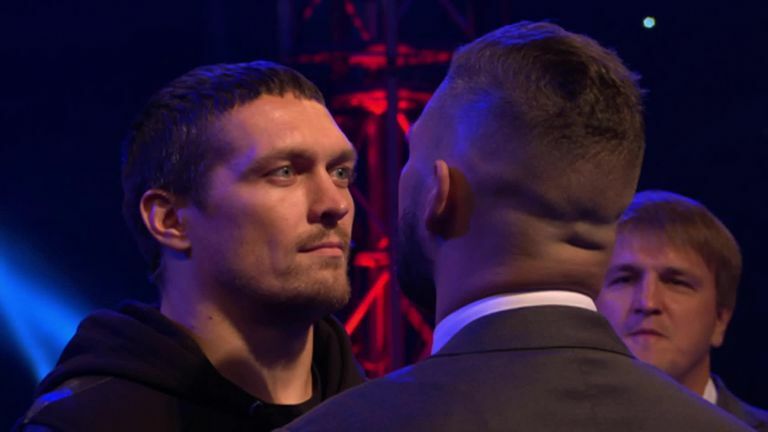 Usyk's staredown suggested to me he was trying to read into Bellew, but got nothing in return. We know Bellew likes to get under people's skin, but I'm not sure he can against Usyk, who seems like the ultimate professional. He is very mentally strong, and has travelled the world, coming up against all sorts of characters. He seems like a very cool customer. I think we might see Bellew trying to get into Usyk's face. He's fiery and that gets him going. As we approach fight night, Bellew will be trying all sorts of tactics. I don't think it will work. I don't think Usyk will understand what Bellew is saying - and that is a good thing for him! I think Usyk can speak a bit (of English) but not much. Bellew's language won't be a problem. He's not going to be bothered about what Bellew says, but Bellew will still probably be talking s***. Usyk won't care about it. He is a different man, has a different mindset. The Ukrainians are different people. I doubt he will lose his cool during fight week. His professional experience is limited, but he has that amateur level pedigree. He will be very disciplined and mentally strong. I don't think Bellew will be able to get under his skin with anything he says. If I was Tony I'd be talking it up, talking about having a war, telling Usyk I will be coming at him from the first bell. Hopefully he will bite and then when that bell sounds, I would do the opposite, I would stay back and box, with lots of feints and good head movement, and not become predictable. I would try and bluff Usyk that way. Everyone knows that Bellew has bottle, is brave, and can have a war, but don't underestimate his boxing IQ, or how smart he is. He might not be able to get him wound-up or annoyed in the build-up, but he can get him expecting something completely different to what he's going to get. Everyone knows that Bellew has bottle, is brave, and can have a war, but don't underestimate his boxing IQ, or how smart he is. I do think that could work.